Q: What is "Gamemodes for GMod" ? 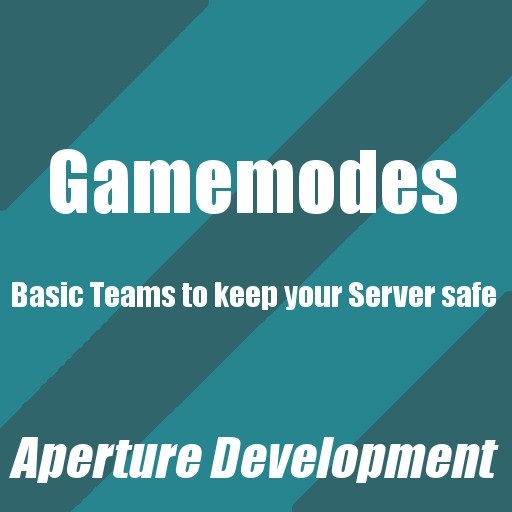 A: Gamemodes for GMod is a team system which allows you to seperate your users in Fighters, Builders and Spectators. It comes with an Fancy GUI and a small Permission system. Q: Will this addon Inteference with my Prop Protection, Admin Mot etc. ? A: No. Your addons should be able to overwrite permissions of "Gamemodes for GMod" as we return Nil when someone has permissions to something. Q: Will this destroy my gmod teams ( e.g. UTeam ) ? A: No. It uses it's own Team system. It should never interact with other teams. Q: Can you add support for ... Admin mod ? A: Sure. Write a request on our website Link and we will add it as soon as Possible. Q: This is Scrapt! I could do better. Q: Can you add ... feature? Q: I have an not listed question.